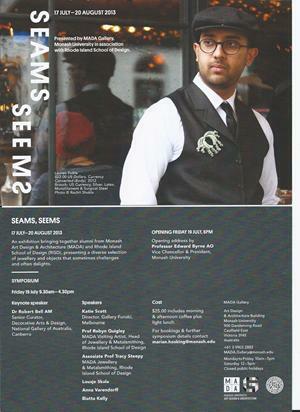 SEAMS, SEEMS is an exhibition of diverse jewellery and objects that brings together alumni from Monash University Art Design and Architecture and Rhode Island School of Design (USA). A symposium for this project will be held on Friday, July 19th, with a range of speakers including Dr Robert Bell of the NGA, Prof Robyn Quigley and Assoc Prof Tracy Steepy, both of Rhode Island School of Design, and Katie Scott of Gallery Funaki (yours truly). Contact Marian Hosking at marian.hosking@monash.edu for bookings and more information.